You know that awful feeling you get when your phone keeps buzzing notifications? Have I left my laptop open at work revealing my Amazon basket full to the brim of cheap yet functional underpants? Did I forget one of the children somewhere? What you don't expect is for one of your Tweets to feature in The Evening Standard and a whole bunch of people liking it. Earlier in the day Southern Rail announced that its Twitter feed was going to be handled by Eddie, a lovely lad on work experience. I am a bit of a Southern Rail troll. Very few weeks in the year pass by where I don't take to Twitter to alleviate my frustration at whichever poor bugger is in charge of the feed that day. I guess I should apologise, but I won't. 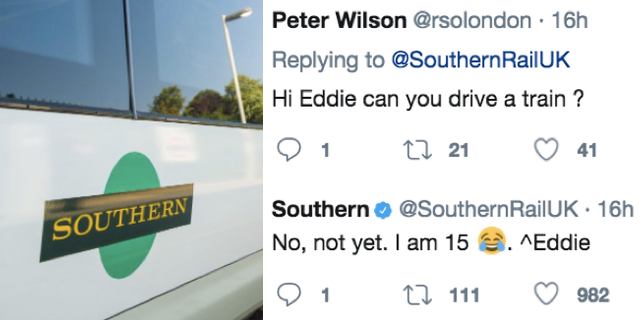 Yesterday however, all the years of anger, bitterness and resentment washed away once Eddie took control of Southern's Twitter. I felt delighted that Southern had the courage to do this, and even more pleased that Eddie agreed to enter the lion's den. Far from receiving a torrent of angry abuse, complaints and sinister Twitter lynching, Eddie received quirky questions, encouragement, love, praise and general adoration from the Twitter crowd. I decided to weigh in with my own virtual fist bump and back slapping. Putting aside the engorging effect receiving multiple likes and follows had on my ego, the halo effect for Southern was that for a few hours on a Tuesday afternoon, the rail company that everyone loves to hate captured the hearts and minds of a fair few commuters. An achievement that I'm sure the marketing team has been thinking on for years and failed to execute. It was a masterstroke by whoever was managing Eddie and a testament to the comms team for having the fortitude and foresight to go ahead with it. I'm off to catch the 10:48 from Tattenham Corner to London Bridge, it may (probably) will be late, but I may (probably won't) think twice before taking to the social airwaves and expressing my displeasure. I can't believe I'm saying this but well done Southern. Oh and well done Eddie! Twitter. It’s not just there for the nasty things in life. Like when Eddie the work experience teen took over Southern Rail’s Twitter feed and just for an afternoon its 161,000 followers forgot all about over-priced poorly run commuter trains, and had some fun instead. Southern Rail, where a 15 year old on work experience does a better job in a few hours than the entire company has done since its inception. Love this! Bless little Eddie!